SEVEN students have achieved an incredible eight H1s in the Leaving Certificate – and it appears to have come as a surprise to them as much as anyone else. 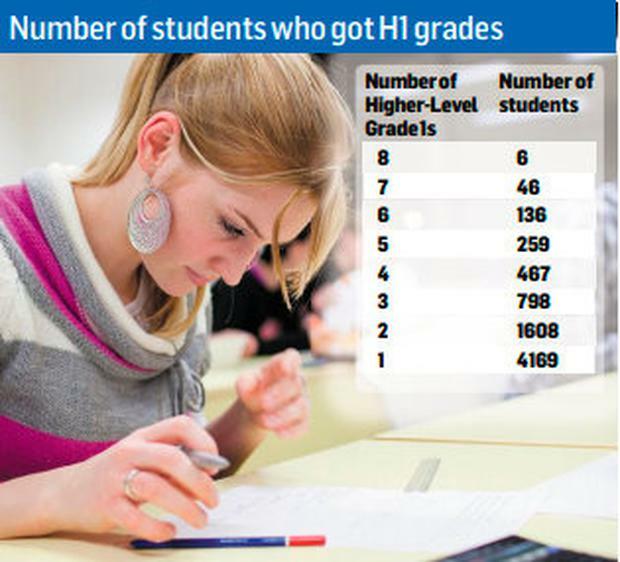 As more than 57,000 candidates receive their results, a breakdown of the data shows 7,490 students were awarded at least one H1 – a mark of between 90pc and 100pc – while seven are celebrating eight H1s. The seven were in Coláiste Pádraig CBS in Lucan, Oatlands College in Mount Merrion, Christian Brothers College in Dún Laoghaire, St Andrew’s College in Blackrock, Christian Brothers College in Sidney Hill, Cork, Midleton College in Cork , and Yeats College Galway. All seven are young men. A H1 grade is between 90pc and 100pc – under the news system introduced last year. 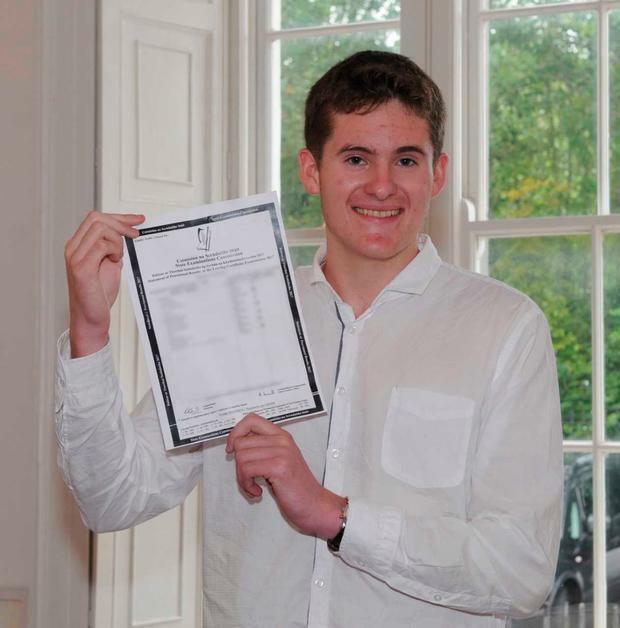 One of those who somehow managed to get 8H1s is 18-year-old Harry Deacon, who was left feeling “over the moon” this morning when he opened the envelope. “I was very nervous last night and didn’t get much sleep, there was an element of wanting the anticipation to be over,” Harry told Independent.ie. The Sandymount native, who has an offer to study Economics and Management in Oxford University in the UK, attributed a combination of hard work and down-time to his success. “St. Andrew’s College is a brilliant school with all the effort and dedication they put into their students, but it’s all about balance. Proud headmistress of St. Andrew’s College in Blackrock, Co Dublin Joan Kirby described Harry as a “role model” for students and put his results down to a strong work ethic. “Harry has a fantastic work ethic, he was such an all-rounder,” Ms Kirby told Independent.ie. 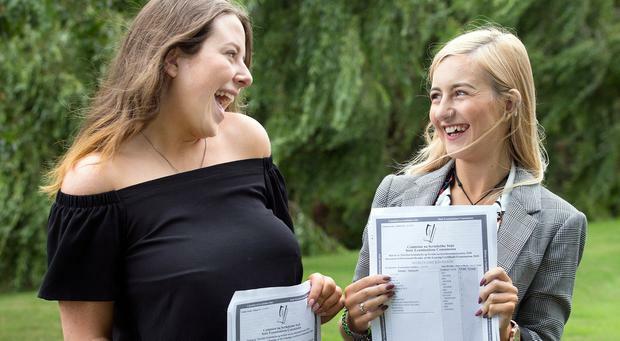 Kathlyn O’Neill, 18 from Tara Hill and Shereen Kavanagh, 18, River Chapel, celebrate their Leaving Cert results at Gorey Community College. It was also top of the class for Daire Byrne from Lucan Co Dublin this morning. The Colaiste Phadraig student was taking it all in his stride however saying that these results were just a “check-point” for him. The next stop for Daire is Edinburgh but his sights are already set further along the road on Oxford. “There is a Mathematics programme in the University of Edinburgh which I got a provisional offer for earlier in the year. Daire (18) reckoned his parents had hoped he’d bag such high points but they didn’t put pressure on him ahead of the big reveal. “They’re very happy,” he said. Principal Tony Brady was full of praise for his star pupil, who he said had always been academically brilliant but also had time for extra-curricular activities within the school. “Daire is a credit to the school. He’s always been outstanding but he has also regularly taken part in the BT Young Scientist and also is one of the team who have won Tráth na gCeist,” said Tony. Colaiste Phadraig is a CBS school and Tony who has been principal at the school for four years now said that Daire was a great example of how you don’t have to attend a private school to achieve such great results. 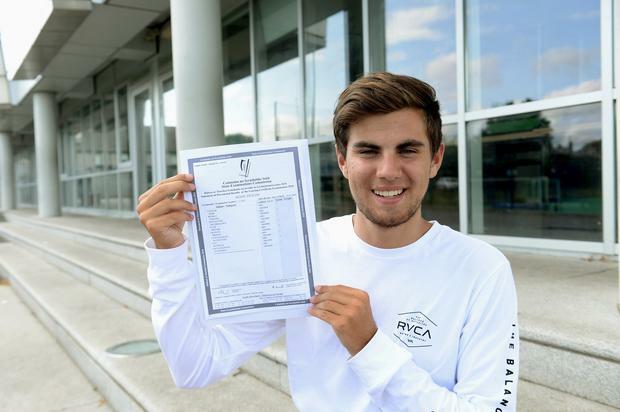 Another who achieved an incredible eight H1s is Alan Hickey (18), from Foxrock in Dublin. 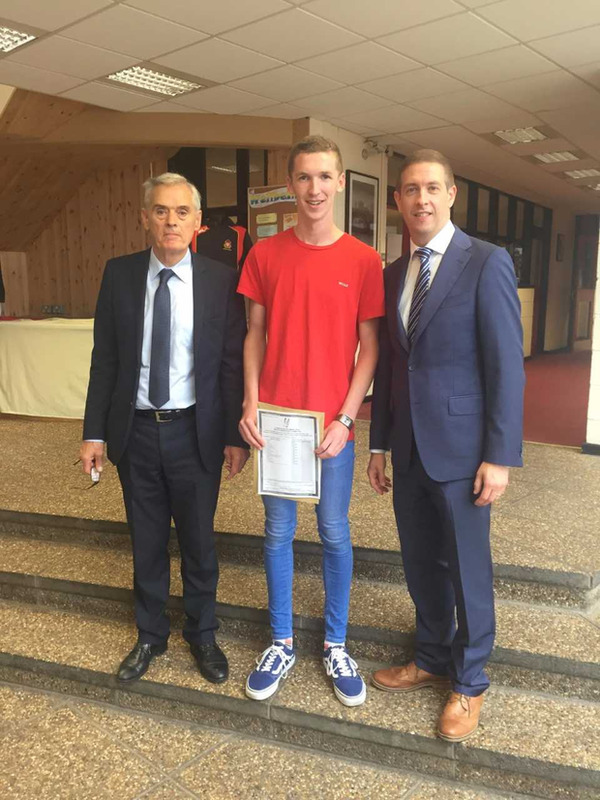 The teenager attended CBC Monkstown and said he is over the moon with his results and hopes to study engineering in UCD from September. He told Independent.ie: “I’m so relieved that it’s all over and I can just relax now. “I was working yesterday as well so that kind of took my mind off things, I met my friends afterwards to talk about it but this morning wasn’t great, I woke up around 7am and it was a nervous wait until I was able to get them at 9. “I was relieved when I opened the envelope and saw that I had gotten eight H1s, I had done fairly well all year in exams and to get six H1s was a target of mine but I never expected to get eight. “I went to a nice quiet corner of the school to open my results and my parents were waiting outside, so I think they were a bit nervous that I took a while and people were coming out in front of me. Despite his incredible results there was no rest for Alan today, as he is hard at work at his job in a school uniform shop in Sandyford. He did say he plans to celebrate later though, he said: “I’ll be heading into town, I’ll be meeting my mates after work and we’ll probably end up on Harcourt street. Alan was the head prefect at the south Dublin school and had some advice for others who are gearing up to begin sixth year. “I didn’t want to become a recluse during sixth year, I have heard how easy it is to get tunnel vision so I tried to continue to keep other things going in my life, there’s more to life than the Leaving Cert and academics. “I would tell anyone that it’s a marathon, not a sprint, it takes hard work from the beginning and it will pay off in the end,” the modest student added. Dr Gerry Berry, Principal of CBC Monkstown, said that he was very proud of Alan’s achievement. He told Independent.ie: “We’re over the moon for him, he’s a lovely, lovely guy and made a great contribution to the school life. He continued to say that there were a lot of happy students and teachers at the school this morning. “All of the results were really good, we’re more than pleased to say that they exceeded our expectations. “We wish the group well going forward with their futures and they’ve set a great example for our younger students. “It’s also a great day for their teachers, who helped to get them this far, I’m sure they will also be celebrating today,” Mr Berry said. 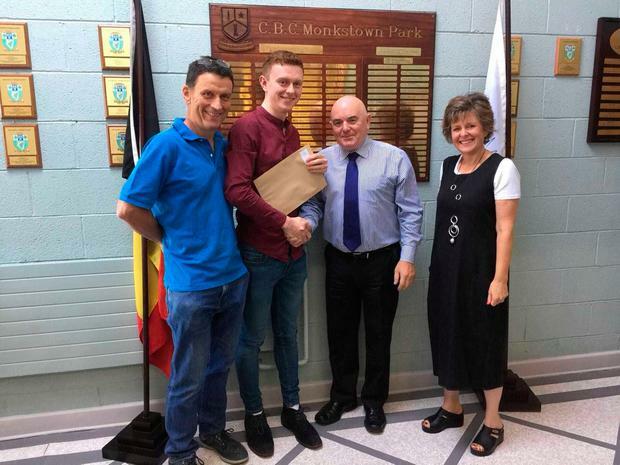 There must have been something in the water in Dublin as another star student was Andres Clarke who is a pupil at Oatlands College, Mount Merrion in Dublin. It’s a double celebration for Andres, as today also marks his birthday. The Donnybrook teenager said it was a “surreal moment” when he opened the envelope this morning. “I’m hoping to study Natural Sciences in Trinity. I’ve always had a keen interest in science and did all the science subjects for my Leaving Cert,” he explained. High achiever Andres said that having a part-time job during his final year at school as well as swimming helped him take a step back from study when he needed to. Now he is looking forward to diving into student life, and starting a new chapter at university. Principal Caroline Garrett told that the school was “thrilled” with Andres’ performance. It’s the second year in a row that the school has had a student soar to such heights, and overall Ms Garrett said the results this year reflected very positively for the Christian Brothers College. “We had 52pc of students achieve over 400, 21pc achieved over 500, and seven students achieved over 600 points,” she said. In Cork, Alex Burke said he was filled with “relief” this morning after seeing his results. “It’s such a relief, I really wasn’t expecting those results,” Alex (18) told Independent.ie. The Montenotte boy praised his school, Christian Brothers School on Sidney Hill, Co Cork for their dedication throughout the year. “The school were fantastic, they helped us a lot,” he said. Top of the class Alex told Independent.ie that he hopes to land a spot in University College Dublin (UCD) when CAO offers come out next week. “I’m hoping to study Medicinal Chemistry in UCD. I went to the open day and just fell in love with the college. “I was always interested in chemistry and I always wanted to do something to help people. I was always interested in cancer research. I fell in love with chemistry from day one here in school and then I thought about ways to apply it. Alex said he was really surprised when he scored the maximum 625 points. He stressed that the results hadn’t sunk in and that while he was hoping to do well he had exceeded all of his expectations. Principal David Lordan said Alex was “the star” of results day this morning, praising his hard work during his school career. “We’re thrilled, it’s been a great morning all round and Alex is the star of the show,” Mr Lordan told Independent.ie. Also in Cork is Liam Mariga from Midleton College. His principal described his “delight” at Liam’s “exceptional result”. “Liam is one of triplets, so it is a big day in his household today,” said Principal Edward Gash. Speaking to Independent.ie, Liam said: “It hasn’t hit me yet but I’m delighted. “I was hoping for five or six H1s anyway. I was happy with the exams- they went almost as I’d hoped . I had a few doubts ( about how well I did ) but i didn’t want to worry about it all summer. “I’m hoping to study Medicine in Trinity. I hope to go on to become a neurosurgeon. “I didn’t throw my life away (with regard to how hard I worked ). I still played hockey and went out with friends. “I paid attention in class and did homework and built up the amount of study I did as the exams drew near. 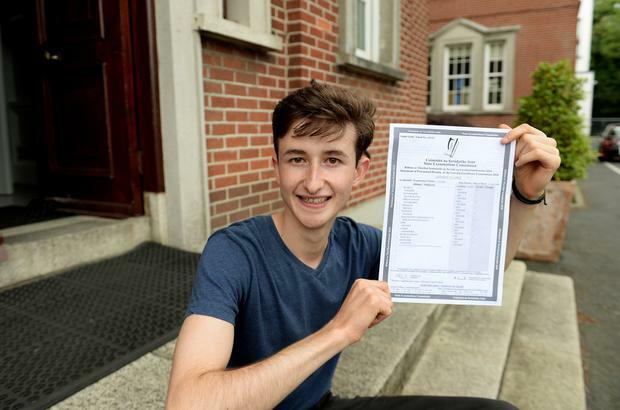 Another young man who also notched up eight H1s is Lorcan Mulkerrin (17), who attended Yeats College in Galway. Lorcan is planning to study medicine at Trinity College Dublin and has thanked all of those who helped him in the run up to the exams. His parents said they are “over the moon” and celebrations will be in full swing this weekend for the All-Ireland final against Limerick. When asked about Lorcan’s secret to success, his mother said; “Slow and steady like the tortoise”. Principal Terry Fahy congratulated Lorcan and said that he was delighted with the top marks achieved by his students. “Lorcan was here on a two year course and he worked very hard throughout the programme. 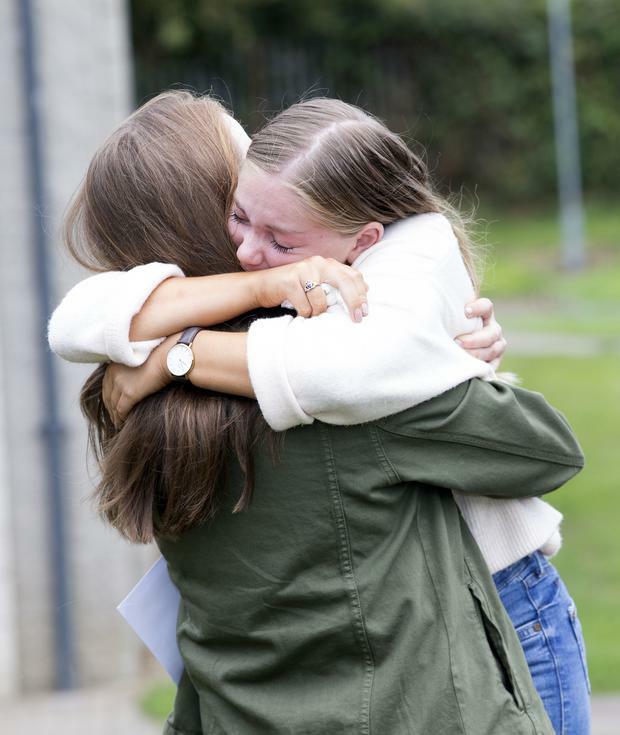 “It’s a great day, I’m delighted for all of our students who got their results today. “The teachers worked so closely with all of the students to help them to reach their full potential and you could really see the end result of that this morning as the results were given out – the relief and happiness amongst everyone was clear to see,” he said. Overall, Leaving Cert students are aiming higher and are rewarded today with a jump in the numbers achieving the highest grade in a subject.